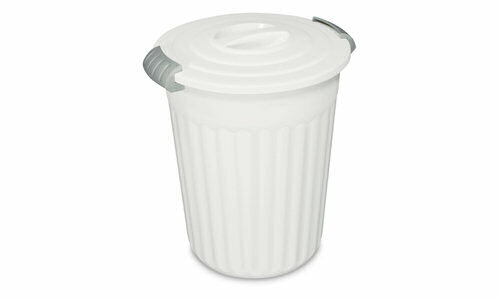 The 24 Quart Utility Can offers an attractive round, polished profile and a sensible, modern aesthetic to a household must have. Two securing latches are integrated into the handles of the base for comfortable carrying and quick access. When latched shut, the Utility Can may be knocked over without the concern of the lid coming loose and contents spilling out. 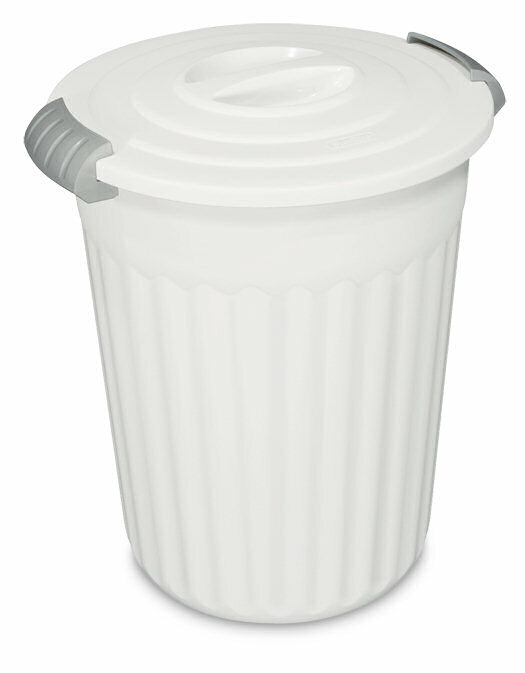 With its generous 24-quart capacity, this Utility Can is great for pet food storage, recyclables or garage organization. It can hold most sizes of birdseed packages, standard small-to-medium bags of pet food, rock salt or potting soil. 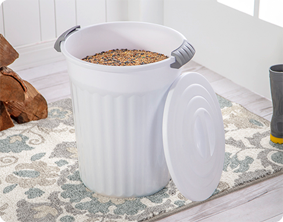 The generous capacity of the Utility Can is great for storing birdseed or rock salt in entryways or in the garage. 24 Quart Latching Utility Can is rated 5.0 out of 5 by 10. Rated 5 out of 5 by Malinda from Perfect Pet Food Container This is the perfect container for storing dry dog food! It is sturdy, can be stacked, the lid locks even the smartest dog out and the seal keeps the dog food fresh. I buy my food in bags and this was designed perfectly. I highly recommend! Rated 5 out of 5 by Jenni M from So far so good I just purchased this a few months ago. Our new puppy had a problem with clawing at the bag of dog food causing it to spill everywhere. So I did some research and I was linked to the Sterilite website from my google search. I found a local store that carried this and went there the same day. Now my puppy is unable to open it to make a mess! It also keeps the food fresh and the smell out of my house! Rated 5 out of 5 by Vking1948 from Great Features Not only do I use this product to store food for my cat, but also to store various craft and sewing items. I tried other products, but this utility can works extremely well for storage and is very cost efficient. Love it! Rated 5 out of 5 by John LeFrancois from Best product ever made! Has many uses. Cat food/Dog food storage, bird food storage, great to make root beer and wine in, apple cider etc. Rated 5 out of 5 by alex2616 from Love the Latches This is a great product for dry storage! I love the latches that securely seal the contents. Great for bird seed and pet food, and probably most any other bulk product you want to keep dry. I was disappointed that Outdoor durability wasn't as good as I expected but discovered later that this product was primarily designed for indoor use. I would definitely purchase this and any other Sterilite product again. Rated 5 out of 5 by Chrystal from Durable and Useful I purchased two of these containers to store dog and cat food in. It holds the larger bags of food perfectly. I have had them for over two years and they still look great. I would love to purchase more but cannot find them in my area anymore!